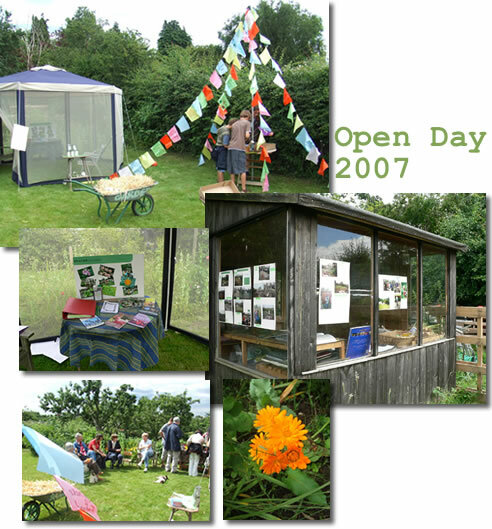 To celebrate our 7th year in action, many people came to the Open day on a beautiful sunny Sunday in June 2007 to see for themselves what can be done when you work as a team. In the morning some of the group members came to set up the gazebo, the plant stall and sorted out some games for the children. 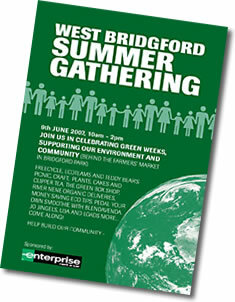 To decorate we put up our flags of good wishes and hung CDs with quotes and sayings in trees and in strategic areas. The gardens looked very festive and inviting. At around 2 most of the members of the group had arrived with cakes, biscuits, or home made cordials and were ready to show the visitors around. In little groups of 2-6 people they had a chance to sample the peas (the best ever!) and treat themselves to the wonderful raspberries. A visit to the Pecking Hen Project gave an additional bit of interest as not many allotments are able to keep animals and was therefore an unexpected surprise. I now realize even more that we are very fortunate! The courgettes are starting to come, both the yellow and green ones, we just hope that the so loved butternut squashes and Uchi Kuri pumpkins get the warmth they so long for and give us fruit at the end of the Autumn. Also two visitors who used to be members came to revisit the gardens and started to get itchy fingers again. They joined and will share the joy of gardening with us once again.